Argh! 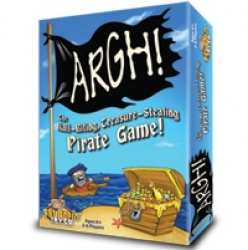 is the Treasure-Stealing Game of Plundering Pirates! It sparks kids to think fast, claim loot, and keep greed at bay: Draw activity cards until you choose to stop, or risk losing it all to a pirate. Ahoy and welcome to Plunder Island! Here be an island jimmy full of treasure just waiting for the taking. Be the scalawag to claim the most loot and win. Keep your sticky fingers in motion pulling treasure from the island. Just use your wits, mate -and remember how many pirates still lurk about. Avast ye -- They're a vengeful sort. Beware! If greed gets the best of ye, the pirates will steal back their booty! Your sense of adventure and some quick thinking will help ye score the most points! Will you collect the most treasure or will your greed get the best of you? The next card you draw could determine your fate! Fast moving play, blimey-great illustrations -- fun is on deck!